Not to be confused with Sighthill, Edinburgh. Sighthill is a housing estate in the Scottish city of Glasgow. It is situated north of the River Clyde. 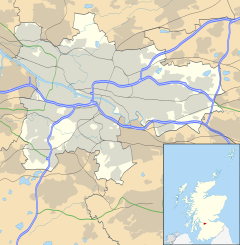 Sighthill is part of the wider Springburn district in the north of the city. The area is bordered to the north by Cowlairs, to the east by the Springburn Bypass road, to the west by the Glasgow to Edinburgh via Falkirk Line running into Queen Street Station and to the south by the Townhead interchange of the M8 Motorway. The area is split into two sub-areas, Pinkston to the south and Fountainwell to the north. The district is primarily residential and originally consisted of ten 20-storey slab tower blocks, seven 5-storey maisonette blocks and five rows of tenements. Designed by Crudens Ltd, the scheme was built by Glasgow Corporation Housing Department between 1964 and 1969 on the 'Soda Waste' at Pinkston and Fountainwell Farm, near the cemetery. The former was derelict ground on which the United Alkali Company's St. Rollox Chemical Works, founded by Charles Tennant and at one time the largest chemical manufacturer in the world, used to dump waste chemicals (particularly hydrogen sulfide, a byproduct of the Leblanc process) until its closure in 1964. The Chemical Works was located on the north bank of the Monkland Canal, immediately east of Port Dundas, where the current Pinkston area of Sighthill is now located. The neighbourhood (scheme) later suffered from stigma, as high rise living went out of fashion. It has suffered from low demand since the mid-1970s, despite its proximity to the city centre. Because of its low occupancy rate, Sighthill was selected in the late 1990s, along with nearby Red Road, as a temporary housing location for refugees and asylum seekers. As a result, Sighthill has one of the most diverse ethnic makeups in Scotland. In 2005, letting was suspended in the Fountainwell side of Sighthill as new landlords, Glasgow Housing Association considered the estate's future. The decision was eventually made that Fountainwell should be demolished. The first two blocks were demolished in July 2008 with the three remaining Fountainwell blocks following in November 2009. The fate of the five remaining Pinkston blocks has now been decided. After a campaign by local residents, at least two of the blocks were to be retained and refurbished by Glasgow Housing Association, with three being demolished or sold to private developers. This however will not be happening. After agreeing to retain the two blocks (Pinkston & Hartfield Heights), GCC then bid for the 2018 Youth Olympics. They were successful in that they are now on the short list for the games. However, to qualify one must first have an Athletes Village prepared. Hence the total demolition of Sighthill and the 20 year advancement of its planned redevelopment. Sighthill cemetery is located to the north of the estate and originally opened in 1840. Within it stands the memorial to John Baird and Andrew Hardie, the leaders of the 1820 Radical War otherwise known as the 1820 Insurrection. William Mossman and his sculptor sons are buried here. There is also an active Community Council consisting of several committed residents who aim to deal with issues affecting the Sighthill neighbourhood, and it holds regular monthly meetings open to all interested residents with these normally taking place the last Tuesday of the month in the Tesco St. Rollox Community Room. Details of agendas, events etc. can be found on their public Facebook group. The Sighthill Park hosts the first astronomically aligned stone circle built in Great Britain for 3,000 years, and is currently maintained by the Glasgow Parks Department Astronomy Project guided by Duncan Lunan. This project is prominent on the highest point of the hill included in the park itself; it is yet to be completed, but a campaign to obtain its completion is underway. Built at the highest point of Sighthill Park, the stone circle has a vantage point over the surrounding tower blocks of the north-east Glasgow estate. There are 17 stones in the circle – with 16 forming a circle 30 feet (9 metres) across, and the largest four tonne stone in the centre. The Sighthill megalith was intended as a tribute to both the ancient megalith builders and the scientists who discovered their significance. The recently closed Sighthill Primary School was also demolished after the tower blocks due to an arson attack. Sighthill was earmarked for the building of The Athletes Village of The 2018 Youth Olympics. The bid was lost, but regeneration will go on anyway. All demolition works in Pinkston were carried out by Technical Demolition Services. ^ "Disappearing Glasgow: documenting the demolition of a city's troubled past". The Guardian. 22 April 2015. Retrieved 2 September 2018. ^ "Don't knock our homes down!". Evening Times. Glasgow. 24 February 2009. Archived from the original on 27 August 2011. Retrieved 9 April 2015. ^ Hurley, Frank (4 June 2009). "Pinkston Highrises Saved As Residents Force GHA Retreat". Daily Record. Glasgow. Archived from the original on 2 March 2012. Retrieved 9 April 2015. ^ "Plans to rejuvenate 'Glasgow's answer to Stone Henge'". BBC News. 2 June 2010. Retrieved 9 June 2010. ^ Campsie, Alison (2 June 2010). "Good Heavens... astronomer bids to rejuvenate stone circle". The Herald. Glasgow. Retrieved 9 June 2010. ^ a b "Scots Stonehenge shoogly admits creator". www.deadlinenews.co.uk. Retrieved 5 October 2015. ^ Duncan, Lunan (2013). The Stones and the Stars: Building Scotland's Newest Megalith. New York: Springer: Science & Business Media. p. 262. ISBN 978-1-4614-5354-3. Wikimedia Commons has media related to Sighthill.